If you ever wonder why kids today have no social skills - when you greet them they just grunt a reply and don't make eye contact. Well, here is the big clue. Kids learn how to relate to people by talking on-line and in text messaging. They don't actually need to know how to shake hands, make eye contact, or make small talk in this day and age. Noah is on the fast track to being a punk kid too. I am mostly kidding, Noah does not actually use the Internet .. but he pretends to. I do think that it has to be part of the reason so many kids don't know how to interact with others very well. It's good that Noah (and the other kids) can be exposed to new people all the time, we can balance out his Internet addiction with all the real-live-human (team) interaction. I got a ride a home with Beth today after our Psychologist interview. She had lunch here before having to head back to Port. The interview was sort of non-existent. We had to talk about how we handle difficulty, and where we went to high-school and college. Really probing stuff like that. It took 13 minutes. AA delayed the flight by more than an hour. The team won't get in until almost sunset. I left Dad and Troy to pick them up. Now that we see it will be 80% night driving, I am especially glad that I am not behind the wheel of either truck. This is the very unlucky cow that is breathing his last oxygen right now ... poor guy is on death row and he doesn't even know it. Rony and Adam just came to get me to give them my stamp of approval. I get it when they ask Troy, but what the heck do I know? 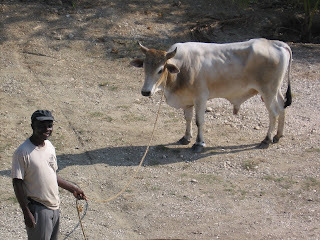 I went out and nodded, smiled and said "bon bef" ---- (nice cow) that seemed to be the response they wanted, so they took the poor cow to eat one of his last meals on the hill. I will be nowhere to be found when they kill this thing, I do not need to learn the process for that. No thanks. I like to think of cows packaged in the grocery store ... nothing prior to that.